This route starts and finishes along the Ribble Way, but also follows parts of the Dales Way and the Pennine Way. The development of the Pennine Bridleway has changed the appearanceof the route up to and including Gavel Gap (which is now quite a smart gate, rather than a gateway filled with breeze blocks. Thanks to David Bunting for these notes, which should be used to reach Gavel Gap and the Ribble's source:. We hope to revisit this woalk in the near future - and write it up in more detail and with more photographs. We parked by pulling off the B6255 - there are no proper parking spaces, but there are various spots where you can pull off either the "B" road, or the unclassified Dent road. From the junction, walk north to the Ribble Way sign. The path is very unclear on the ground, but head south east until a clearer track is joined near a sheepfold. The track curves to the east, then north east, following Long Gill. It then crosses the stream, to follow the left bank of Jam Sike, reputedly the longest tributary stream of the Ribble. The path becomes less clear and crosses the stream twice before reaching Gavel Gap, the end of the Ribble Way. Following the boundary wall south leads to a small limestone outcrop from which (in very wet weather) a tiny spring flows - the source of the Ribble. 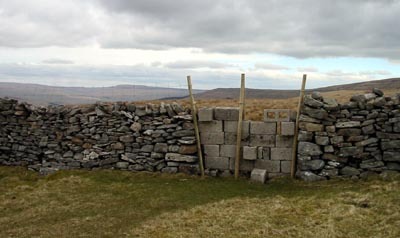 The breeze blocks which fill Gavel Gap have been arranged to form a stile. Cross this and head east across an area of limestone pavement (there is a path marked on the map - though not a right of way - and it certainly isn't clear on the ground. The field boundaries are a great help to navigation. 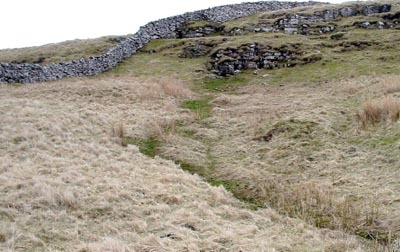 Cold Keld Gate is at the far side of the second sheepfold, and leads on to Cam High Road. Turn right on to Cam High Road - which runs as straight as Roman Roads are reputed. This has a tarmac surface for a few hundred yards, then the tarmac surface heads down to Cam Houses Farm, and a muddy track leads ahead. It looks as though this track is heavily used by off road vehicles, in addition to the hardy souls who walk the Pennine Way. After about a mile and a quarter the Dales Way joins the track from the left. 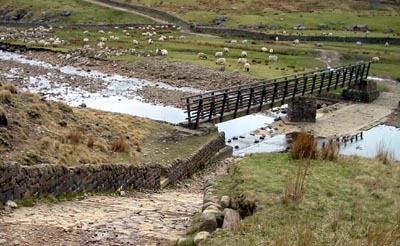 Just before the track joins the road, it crosses Gayle Beck by means of a wooden footbridge (or an impressive ford). Instead of following the Dales Way - we turned right and walked along the road for about two thirds of a mile - until we reached the farm road pictured below. We followed this north, then north west, until we re-joined the Dales Way and Ribble Way. The path continued north until it met the unclassified road into Dentdale. Here we turned right to return to the road's junction with the B6255.